When a patient reports a “head ache in right side of forehead during night”, which will be the deal rubric to be considered for repertorization? If we take the MAIN RUBRIC ‘Head ache in general’, and its SUB RUBRICS ‘headache in general in forehead’, ‘headache in general in forehead- right side’ and ”headache in general in forehead- right side’-at night’ as separate rubrics, many drugs will be repeated inordinately, giving high marks for such drugs. Actually it is a SINGLE symptom, and as such it should be represented by SINGLE RUBRIC for correct repertorization. Similimum Ultra Software provides a special tool to resolve this issue. While selecting and adding rubrics from repertories, there is provided on the lower part of the window an optional button ADD WITH UPPER LEVEL RUBRICS. If you use this option, the selected SUB RUBRIC will be automatically COMBINED with its all UPPER LEVEL rubrics and added to RUBRIC BASKET. By this combining, repetition of same drug listed under different upper levels will be avoided, ensuring that each drug is added only once. 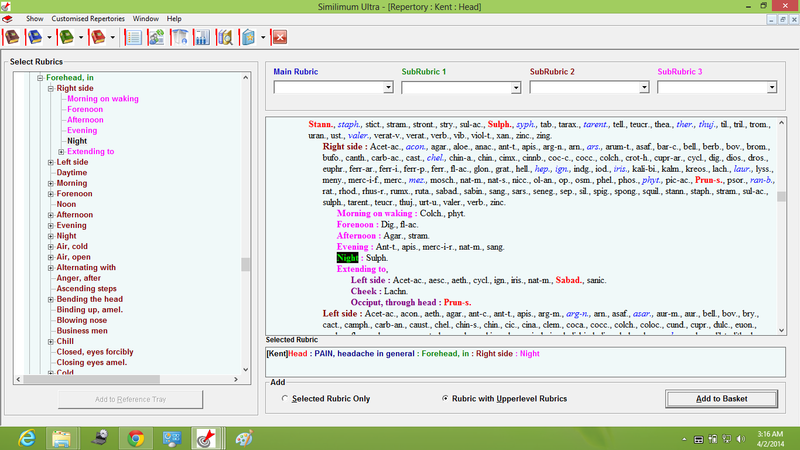 This tool is a great innovation of Similimum Ultra that ensures right repertorization out put. Abrot., Absin., Acet-ac., Acon., Act-sp., Aesc., Aeth., Agar., Ail., All-c., Aloe., Alum., Alumn., Ambr., Am-c., Am-m., Ammc., Anac., Ang., Ant-c., Anthr., Ant-t., Ap-g., Apis., Apoc., Arg-m., Arg-n., Arn., Ars., Ars-i., Arum-t., Asaf., Asar., Aur., Bad., Bapt., Bar-c., Bar-m., Bell., Benz-ac., Berb., Bism., Bor., Bov., Brom., Bry., Bufo., Cact., Calad., Calc., Calc-p., Calc-s., Camph., Cann-i., Cann-s., Canth., Carb-an., Carb-s., Carb-v., Cast., Caul., Caust., Cham., Chel., Chin., Chin-a., Chin-s., Cimic., Cina., Cinnb., Clem., Cob., Coca., Coc-c., Cocc., Coff., Colch., Coloc., Com., Con., Conv., Corn., Croc., Crot-c., Crot-h., Crot-t., Cund., Cupr., Cupr-ar., Cur., Cycl., Daph., Dig., Dios., Dros., Dulc., Elaps., Elat., Eug., Eupho., Euphr., Eupi., Eup-per., Ferr., Ferr-ar., Ferr-i., Ferr-p., Fl-ac., Gamb., Gels., Gent-c., Gins., Glon., Gran., Graph., Grat., Guai., Gymn., Ham., Hell., Hep., Hipp., Hura., Hydr., Hydr-ac., Hyos., Hyper., Ign., Ind., Indg., Iod., Ip., Iris., Jal., Jatr., Jug-r., Kali-ar., Kali-bi., Kali-c., Kali-chl., Kali-i., Kali-n., Kali-p., Kali-s., Kalm., Kreos., Lac-d., Lach., Lachn., Lact., Lact-ac., Laur., Lec., Led., Lil-t., Lob., Lyc., Lyss., Mag-c., Mag-m., Mag-p., Mag-s., Manc., Mang., Med., Meli., Meph., Merc., Merc-c., Merc-i-f., Merl., Mez., Mill., Morph., Mosch., Mur-ac., Murx., Naja., Nat-a., Nat-c., Nat-m., Nat-p., Nat-s., Nicc., Nit-ac., Nux-m., Nux-v., Oena., Ol-j., Osm., Ox-ac., Pall., Par., Petr., Ph-ac., Phel., Phos., Phys., Phyt., Pic-ac., Plan., Plat., Plb., Podo., Poth., Prun-s., Psor., Ptel., Puls., Ran-b., Ran-s., Raph., Rheum., Rhod., Rhus-t., Rhus-v., Rumx., Sabad., Sang., Sec., Sel., Seneg., Sep., Sil., Sol-n., Spig., Spong., Stann., Staph., Stram., Stry., Sul-ac., Sulph., Tab., Tanac., Tarax., Tarent., Tax., Tell., Ter., Thea., Ther., Thuj., Til., Tril., Trom., Urt-u., Ust., Valer., Verat., Viol-o., Viol-t., Vip., Xan., Zinc., Zinc-s., Zing., Ziz. Acet-ac., Acon., Aesc., Aeth., Agar., Ail., All-c., Aloe., Alum., Alumn., Am-c., Am-m., Ammc., Anac., Ang., Ant-c., Ant-t., Apis., Apoc., Aran., Arg-m., Arg-n., Arn., Ars., Ars-i., Arum-t., Arund., Asaf., Asar., Aster., Aur., Bapt., Bar-c., Bar-m., Bell., Berb., Bism., Bor., Bov., Brom., Bry., Bufo., Cact., Caj., Calad., Calc., Calc-p., Calc-s., Camph., Cann-s., Canth., Caps., Carb-ac., Carb-an., Carb-s., Carb-v., Card-m., Caul., Caust., Cedr., Cham., Chel., Chim., Chin., Chin-a., Chin-s., Chlol., Cic., Cimic., Cina., Cinnb., Cist., Clem., Cob., Coca., Coc-c., Cocc., Colch., Coll., Coloc., Con., Corn., Croc., Crot-c., Crot-h., Crot-t., Cupr., Cupr-ar., Cur., Cycl., Dig., Dios., Dros., Dulc., Echi., Elaps., Elat., Eupho., Euphr., Ferr., Ferr-ar., Ferr-i., Ferr-p., Fl-ac., Form., Gels., Gins., Glon., Gran., Graph., Grat., Guai., Gymn., Ham., Hell., Helon., Hep., Hipp., Hura., Hydr., Hydr-ac., Hyos., Ign., Ind., Iod., Ip., Iris., Jug-c., Kali-ar., Kali-bi., Kali-c., Kali-chl., Kali-i., Kali-n., Kali-p., Kali-s., Kalm., Kreos., Lac-c., Lac-d., Lach., Lachn., Lact., Lact-ac., Laur., Lec., Led., Lept., Lil-t., Lith., Lyc., Lycps., Lyss., Mag-c., Mag-m., Mag-s., Manc., Mang., Med., Meli., Meny., Merc., Merc-c., Merc-i-f., Merc-i-r., Merl., Mez., Mosch., Mur-ac., Mygal., Naja., Nat-a., Nat-c., Nat-m., Nat-p., Nat-s., Nit-ac., Nux-m., Nux-v., Ol-j., Olnd., Op., Osm., Ox-ac., Par., Petr., Ph-ac., Phel., Phos., Phys., Phyt., Pic-ac., Pip-m., Plan., Plat., Plb., Podo., Psor., Ptel., Puls., Ran-b., Raph., Rheum., Rhod., Rhus-t., Rhus-v., Rumx., Ruta., Samb., Sang., Sars., Sec., Sel., Seneg., Sep., Sil., Sol-n., Spig., Spong., Stann., Staph., Stict., Stram., Stront., Stry., Sul-ac., Sulph., Syph., Tab., Tarax., Tarent., Tell., Teucr., Thea., Ther., Thuj., Til., Tril., Trom., Uran., Ust., Valer., Verat., Verat-v., Verb., Vib., Viol-t., Xan., Zinc., Zing. Acet-ac., Acon., Agar., Aloe., Anac., Ant-t., Apis., Arg-n., Arn., Ars., Arum-t., Asaf., Bar-c., Bell., Berb., Bov., Brom., Bufo., Canth., Carb-ac., Cast., Chel., Chin., Chin-a., Cimx., Cinnb., Cocc., Coc-c., Colch., Crot-h., Cupr-ar., Cycl., Dig., Dios., Dros., Euphr., Ferr., Ferr-ar., Ferr-i., Ferr-p., Fl-ac., Glon., Grat., Hell., Hep., Ign., Indg., Iod., Iris., Kali-bi., Kalm., Kreos., Lach., Laur., Lyss., Meny., Merc., Merc-i-f., Mez., Mosch., Nat-m., Nat-s., Nicc., Ol-an., Op., Osm., Phel., Phos., Phyt., Pic-ac., Prun-s., Psor., Ran-b., Rat., Rhod., Rhus-r., Rumx., Ruta., Sabad., Sabin., Sang., Sars., Seneg., Sep., Sil., Spig., Spong., Squil., Stann., Staph., Stram., Sul-ac., Sulph., Tarent., Teucr., Thuj., Urt-u., Valer., Verb., Zinc. Abrot., Absin., Acet-ac., Acon., Act-sp., Aesc., Aeth., Agar., Ail., All-c., Aloe., Alum., Alumn., Ambr., Am-c., Am-m., Ammc., Anac., Ang., Ant-c., Anthr., Ant-t., Ap-g., Apis., Apoc., Aran., Arg-m., Arg-n., Arn., Ars., Ars-i., Arum-t., Arund., Asaf., Asar., Aster., Aur., Bad., Bapt., Bar-c., Bar-m., Bell., Benz-ac., Berb., Bism., Bor., Bov., Brom., Bry., Bufo., Cact., Caj., Calad., Calc., Calc-p., Calc-s., Camph., Cann-i., Cann-s., Canth., Caps., Carb-ac., Carb-an., Carb-s., Carb-v., Card-m., Cast., Caul., Caust., Cedr., Cham., Chel., Chim., Chin., Chin-a., Chin-s., Chlol., Cic., Cimic., Cimx., Cina., Cinnb., Cist., Clem., Cob., Coca., Coc-c., Cocc., Coff., Colch., Coll., Coloc., Com., Con., Conv., Corn., Croc., Crot-c., Crot-h., Crot-t., Cund., Cupr., Cupr-ar., Cur., Cycl., Daph., Dig., Dios., Dros., Dulc., Echi., Elaps., Elat., Eug., Eupho., Euphr., Eupi., Eup-per., Ferr., Ferr-ar., Ferr-i., Ferr-p., Fl-ac., Form., Gamb., Gels., Gent-c., Gins., Glon., Gran., Graph., Grat., Guai., Gymn., Ham., Hell., Helon., Hep., Hipp., Hura., Hydr., Hydr-ac., Hyos., Hyper., Ign., Ind., Indg., Iod., Ip., Iris., Jal., Jatr., Jug-c., Jug-r., Kali-ar., Kali-bi., Kali-c., Kali-chl., Kali-i., Kali-n., Kali-p., Kali-s., Kalm., Kreos., Lac-c., Lac-d., Lach., Lachn., Lact., Lact-ac., Laur., Lec., Led., Lept., Lil-t., Lith., Lob., Lyc., Lycps., Lyss., Mag-c., Mag-m., Mag-p., Mag-s., Manc., Mang., Med., Meli., Meny., Meph., Merc., Merc-c., Merc-i-f., Merc-i-r., Merl., Mez., Mill., Morph., Mosch., Mur-ac., Murx., Mygal., Naja., Nat-a., Nat-c., Nat-m., Nat-p., Nat-s., Nicc., Nit-ac., Nux-m., Nux-v., Oena., Ol-an., Ol-j., Olnd., Op., Osm., Ox-ac., Pall., Par., Petr., Ph-ac., Phel., Phos., Phys., Phyt., Pic-ac., Pip-m., Plan., Plat., Plb., Podo., Poth., Prun-s., Psor., Ptel., Puls., Ran-b., Ran-s., Raph., Rat., Rheum., Rhod., Rhus-r., Rhus-t., Rhus-v., Rumx., Ruta., Sabad., Sabin., Samb., Sang., Sars., Sec., Sel., Seneg., Sep., Sil., Sol-n., Spig., Spong., Squil., Stann., Staph., Stict., Stram., Stront., Stry., Sul-ac., Sulph., Syph., Tab., Tanac., Tarax., Tarent., Tax., Tell., Ter., Teucr., Thea., Ther., Thuj., Til., Tril., Trom., Uran., Urt-u., Ust., Valer., Verat., Verat-v., Verb., Vib., Viol-o., Viol-t., Vip., Xan., Zinc., Zinc-s., Zing., Ziz.